The Lucid Family is growing at a rapid rate. In 4 years we’ve gone from 0 to nearly 87k online followers. The last two years saw festival participants coming from 32 different states and 10 different countries across 4 continents.We’re selling out earlier and earlier each year, demonstrating a bursting demand in the growing movement of transformational festivals. If you have attended Lucidity before, you can attest to the fact that we’ve created a fully immersive experience with stages, workshop spaces and interactive art densely intermingled with camping and core services. “No there is no more space, and there are no more tickets.”. We don’t want to say NO. We want to say YES!!! Our mission calls for a world where all are invited to create, experience and play in the Lucidity magic. Unfortunately, the reality of our home at Live Oak Campground requires a limit on the number of cars, bodies and experiences on-site. 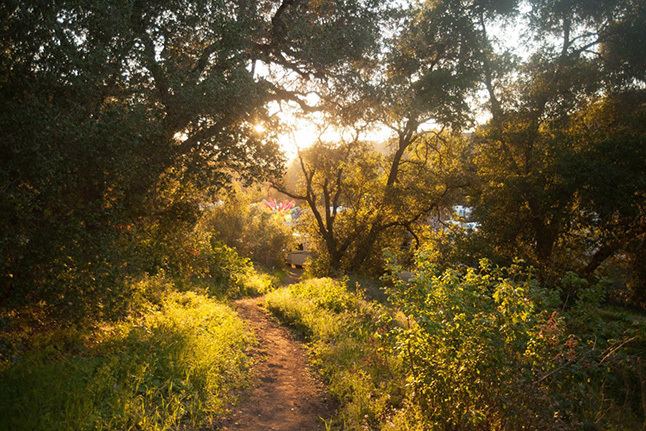 Some background about our venue: Live Oak Campground is sacred Chumash land, the place where the native First People of this area hold their inter-tribal pow wow, and is within the ancient boundaries of Kalawashaq’ (Turtle Shell Village). It is currently “owned” by the federal government and leased by the County of Santa Barbara. Our partnership and agreements are made with Santa Barbara County and we independently receive input and council from Chumash leadership. This year, the County came to us and insisted that we reduce our overall capacity numbers. They expressed concerns about the ecological impact of the festival in light of the drought cycle in the Santa Ynez Valley. In particular, we’ve come to understand that the live oak trees on the site are especially impacted by the driving and parking of so many cars on top of their roots, below the drip lines. On one hand this was hard to swallow knowing that we already have a greater demand for tickets than supply. Which unfortunately means even more saying ‘no’ to our family. On the other hand, we saw this as an opportunity to align with the County as stewards of the land, coming together in partnership for the health and well-being of the trees of this sacred land that we are blessed to call home. To be sure, the metaphor of tending the roots is not lost on us. In the face of the County’s ask, we brought in two local certified arborists and permaculture specialists to assess the health of the oak trees. Based on their recommendations, we developed an Oak Management and Impact Mitigation Plan. This plan will form the content and focus of one of our pre-Lucidity Permaculture Action Days, in collaboration with The Polish Ambassador. One of the less popular components of our Impact Mitigation plan is the significant reduction of cars and humans on the festival grounds. We are aiming to reduce the amount of car camping by about 75% and the number of participants by 20%. Yes, this means fewer tickets are available for a growing audience. With these constraints, we were faced with tough questions: Should we Go Big and find a new venue that will allow us to organically grow upward and outward in the way in which we are poised to do? Or do we continue to enrich the event that we’ve all come to love — stay humble and sink our roots in deeper here at home? The answer came rather easily. All we had to do was look to this year’s chapter of our lived mythology to know The Way. 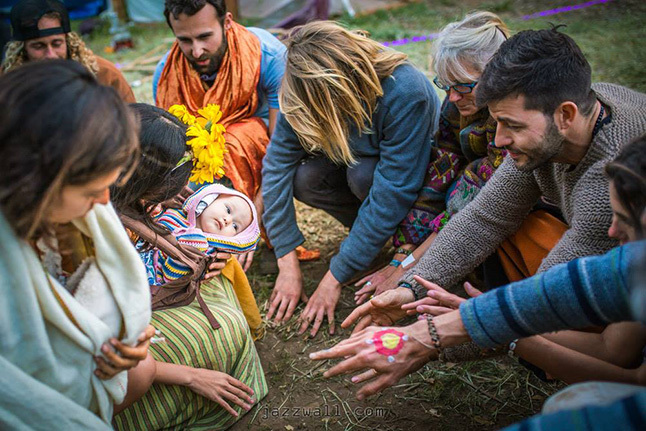 Kindred Quest is an opportunity to learn from our human past: to reconnect with the earth, with community, with family, with tribe, to enrich our roots, deepen our interconnection, and strengthen our bonds. While last year’s Universe facilitated people through great expansions of Self and realizations of Oneness and the cosmos, this year the call is to come back to earth, to ground into THIS life, on THIS planet, and learn how to be in right relationship with Self, with Other, and with Mama Gaia. Clearly, we already made the choice to Grow Home three years ago when channeling and transcribing our story. Truly, a good problem to have. You might be asking, “What does this all mean for me?” First off, you will be happy to learn that we are spending more on your experience at Lucidity than ever before. Increases in ticket prices directly correlate to our increased investment into our immersive environments, our villages, the food experience, the Alive Stage, and rightfully compensating the wide community of people who work tirelessly for the better half of the year to create total magic. It means that our per-participant spending increases dramatically, creating an event that is deeply resonant with your personal needs along your transformational journey. Additionally, we’re asking for a greater sense of environmental stewardship from you. Even more than before, we see a need to tread lightly on the land to ensure the health and well-being of the trees and animals with which we share the space. In line with this, we are inviting just about everyone to REALLY camp for the weekend and leave your cars in the parking lots. Let it be a weekend to connect with each other, and with the soft and gentle nature of Live Oak. Go Big and Grow Home! While we are content with these solutions for Kindred Quest, we recognize that it doesn’t serve Lucidity, or the many fans who want to be a part of our great mythic story, to only Grow Home and ignore the natural urge to expand into new possibilities and new horizons. For this reason, our most authentic approach to the Go Big or Grow Home dilemma is a “YES, AND”. Indeed, many of you will be happy to learn we have plans to produce another medium-sized event within the calendar year to accommodate our family’s desires to be together more often. Keep your eyes and ears peeled. This event will continue to build on our foundational mythos offering a new story within which to participate. Also, as we move into the 2016 chapter of Crossroads, we may have found a venue that is close enough to still be considered home and would be able to accommodate Lucidity Festival’s growth.And what an appropriate theme to compliment a literal crossroads in our development as a festival family! Isn’t it interesting how the story we’ve been telling is finding its way into our experiences and vice versa… it’s almost like we’re dreaming our reality into being… Hmmm….. Finally, we continue our search for Lucid Land, the property where we will build our permanent community and Reinhabit the Village. We’ve had some excellent leads and explored a variety of possibilities and feel like we are spiraling ever closer to the place where we can land for good, dig our hands in the dirt, and begin building our true Lucid Legacy. Hey Jonah, love that Delicious Dilemma has resonated with you all this time. Congrats on your success! I’m happy to see the matter is being considered carefully. i and many of my friends stopped attending lightning in a bottle because we feel the event had “grown too big for its britches”– that is, the event to us had lost much of its appeal as it lost its intimacy, grassroots feel, and connection with its participants. as it grew bigger and bigger we felt it lost its ability to intelligently manage resources like water and law enforcement and became a magnet for a new sort of crowd we weren’t used to dealing with. a lot of people are having the same concerns about events like burning man– that its explosion in growth and income caused it to lose its original focus. lucidity remains “our” festival as it still feels honest and in touch with its participants. thank you for striving to remain this way! Thank you for the support Scarabin! We do our best. Lightning in a Bottle is a great festival too. There are definitely growing challenges the larger a festival gets. These are not easy questions to answer, and we all do our best. Thank you for your participation 🙂 We appreciate you. I am grateful for your process. I love the outcome. I respect your decision with all of me. Beautifully written, beautifully considered, beautifully resolved. I’m proud to be part of the Lucidity family. The journey continues. Thank you for this communication. I have participated in the festival each of the last three years. It may be a good idea to think about why folks car camp. While some utilize their cars during the festival, I think that many don’t. We use our cars for convenient drop off and loading of all of the amazing (and heavy!) things that we like to bring to festivals. After unloading, many of us don’t use our cars again until it is time to pack, much like at Burning Man. While Lucidity, LIB, and others make noble efforts to provide shuttles for schlepping us and our gear from remote parking lots, it is still inconvenient, time consuming, and often in 80-90 degree heat. Basically, it is a drag. The parking passes tend to be worth the money to not have to deal with this. So, long way of saying that perhaps there are creative ways to allow for convenient drop off and pick up of our stuff. I don’t have any breakthrough ideas, but perhaps just letting attendees drive in, drop off, and then go park at the remote lots. Or, perhaps double/triple the number of shuttles. 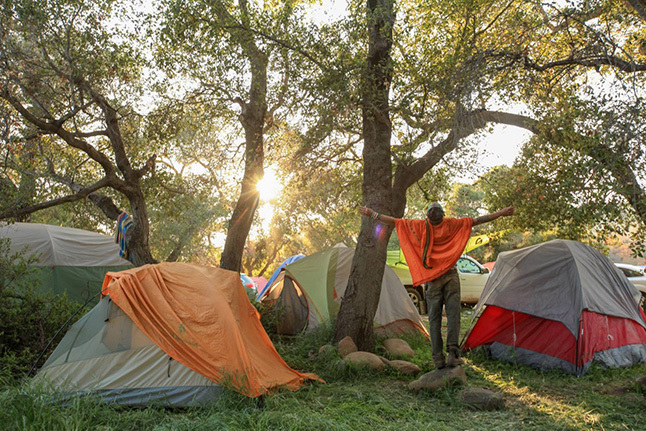 Then, we would have much the same experience, we wouldn’t be parking cars on the roots of the majestic trees, and you can keep the attendee number up but with more space in the campgrounds. Thanks for all that you do. There should be an easy system to drive in, drop off gear, and then park outside. I am totally willing to camp without my car, but we bring art pieces and offerings that we can’t hike in. Yes, we are definitely working on that easy system you speak of 🙂 We are actively working on a solution that is convenient an responsible. We will be releasing more information as this plan formulates. thank you! I’d like to meet anybody that thinks Lucidity would be better if were bigger—and moved to some other venue. There is no dilemma. Bigger is not better. Lucidity is amazing precisely because it’s small and intimate, and because it hasn’t (yet) grown into the sprawl of LIB, Coachella, or any of those other mega-festivals. I for one am quite glad that the county has limited the size of the event, both for the benefit of this gorgeous oak grove, and for the benefit of the festival itself. Can’t wait to play with you all in April! I published my thoughts here. I heard from many members of my tribe when they read this…I am afraid they laughed. Not in a mean spirited way, but in a …Boy, has someone lost their way and have drawn on some sort of cosmic consciousness to propose a solution. With increasing the Vendor Space for a 4th year, decreasing the available space for cars and people, soon this will be 3 days of Vending in the magic forest. Thank you Stuart for voicing your concerns. I waited to approve your comment because we thought you would prefer that your concerns were factually relevant before publishing them online. The fact is, ALL aspects of the festival have been reduced this year, including a 25% reduction in vending space AND tickets sold. Which means Lucidity is actually raising LESS money from vending and ticket sales this year, while putting on a festival that will be more intimate and personal. Our primary motivating factor is not greed, but environmental responsibility. Parking is a luxury, and though parking passes from last year helped us fund bringing in one of our headliners this year, The Polish Ambassador, and offer some free Community Action Days for sustainability, this year we must limit them to limit our impact on the site. That means LESS working funds for next year, and some disappointed campers. But we are proud that most of our community is willing to overcome the inconvenience of limited parking passes, for the sake of caring for the ecology that has hosted us for so many years. Keep the festival small !! Bigger festival lose the family vibe.. Also a big part of Lucidity is the venue, people love it !! 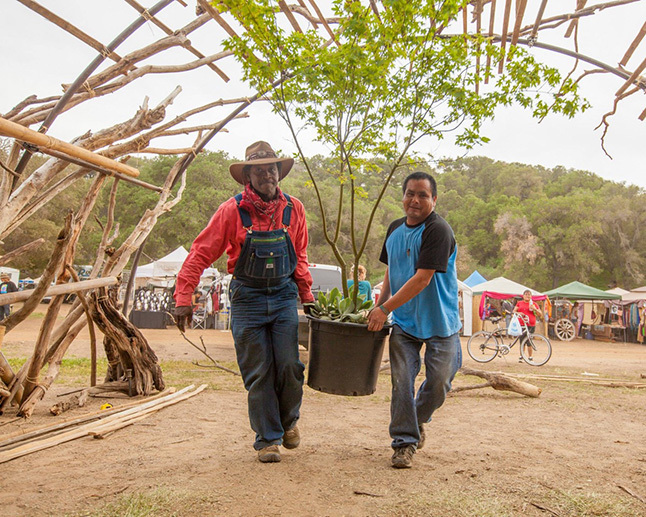 Thank you to the entire Lucidity team for demonstrating community and land-conscious leadership and thoughtfulness. I can only wish that all event organizers would follow your lead in being as inclusive and transparent with your attendees. After all, without them, you couldn’t do what you’re doing and vise versa. I personally know that you’ll find the ideal new venue and Live Oak will continue to serve as a legendary springboard and support system for budding festivals. As pioneers, it’s natural to outgrow and expand, and explore new lands. Avoiding asking too much of a space before it’s too late is the right way – and you all are dancing with that well. Much love to everyone involved – have an amazing Lucidity 2015. Thank you! I am so happy to hear of your choice despite the temptation to go expand in numbers. If we want to create a better paradise of this Earth and live in more harmony as we all talk about so much, we ought to be the leaders and teachers just by doing it ourselves. And your beautiful transparent share about all this teaches as well. So many thanks, support and love! My understanding from reading Malcolm Gladwell’s “Tipping Point” is that 150-200 people is about max for maintaining community intimacy and integrity. It makes sense then to “bud off” new events once that number is reached. I’m not sure what the numbers have been at Lucidity or how many of those participants come from within say 100 miles, but if part of the intention of Lucidity is to build towards a more permanent community, then it makes sense to stay focused on that smaller whole. I would offer that you may want to make some tickets especially available to Lucidity Virgins, so new people – and therefore new ideas and energy – can continue to be integrated with the more stable core of annual participants. my dad says in his day all ya needed was ‘a blanket and a bottle’ to go to a festival. consider what we bring and consider the idea of activated community through nonprofitism of common artistic spaces. i have attended all of the events and it is the common core valued centers of artistic growth like SOL-food, Fishbone, Green Arts People, Summer Solstice Parade and all the wonderful individual fine artisans gathered that make the experience. i know we are what the world needs and i think its time to consider a lucid tour of activated points across the world bringing awareness to the arts that we embody as the living renaissance. transformational arts need to be offered to every community. the standard of our value will be raised and the enlightenment shall begin. know that we are all ahead. lucidity took every participant to create ‘the miracle’, as ‘we are the ones we have waited for’. know that i have let go of many things since lucidity started and the truth on the matters of what we are all about is ‘being the change’. thank you community for the unity. i see so much hope for us all and the desire for a common place to explore creative union. the expansion of our creation is a reminder that universal awareness has been raised and the ripples are set out. we must relax and breath into the now and love all the connections we have made. the future is so exciting and the vision of our journey must go on and on. my suggestion is perhaps a lucidity theme park for “the children of the rainbow”. perhaps have a 3 weekend event??? or maybe even an expansion towards a common goal for our culture, always growing outward dreaming of a future for everybody. maybe we can take it to the people and hold traveling green arts markets and create a map of lucid hotspots for transformative culture. i can see a branching out of the experience from innovative transformative sharing and networking our net worth up by connecting through communications. we have woken the village and found the lost villagers it is time to activate resources and see the future. Lucidity is a renaissance. from the platform we have established the rest of the world can now know it is possible, it is happening, it is the now.